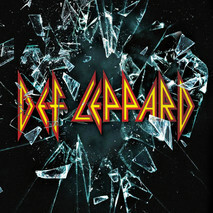 RockUnitedReviews: DEF LEPPARD: "Def Leppard"
'Welcome to the carnival - Welcome to the party'. Nostalgia? Retromania? Put-a-smile-back-on-yer-faceia? I dunno? Let's go (daft pun intended) and pour some sugar on the latest tracks recorded by U.K.'s pride and joy, The Def Leppards. Let's face it. Joe, Phil, Viv, and the Ri(c)ks, are strongly connected to the classic sound and albums. Have they decided to return to what they're doing best and never mind the critics? Possibly, but not likely, since it's not all retro and back to the eighties. It's in fact the rather (too?) diverse sounding platter with bits and pieces of everything from slick melodic rock to 70's Glam, straight-ahead rockers, and the occasional modern rock piece. Do not. I repeat, do not expect all tracks to be 'Let's Go' or full on retro. It's the full Def Lep spectrum from start to present date. It's like if they're trying to please fans of all camps? The opening tracks are also the ones sounding the most like slick Mutt-era. 'Let's Go', the fun arena rocker with sugar in the mix, while 'Dangerous', take a lot of inspiration from 'Photograph' (chorus). 'Man Enough', the fun Def-version of 'Another One Bites The Dust' as the Ri(c)ks are building up the verse with a tight rhythm section and sound. It's BASS and drums with a catchy refrain that reeks of Adrenalize. 'We Belong', the super classy ballad of the album and all members take a turn behind the mic. I believe that KISS took a similar approach on We Are One. 'Invincible', reminded me of a couple of other Brit-acts. It's GUN meet Manic Street Preachers on a date with Def Lep. It's just a great flow and the fun guitar driven track. One of those open roads, top down, car driving tracks. 'Sea Of Love', slightly nerdy 70's Glam Rock with atmospheric/dreamy refrain and some excellent guitar work by Collen/Campbell. 'Energized', Euphoria meet X with the great hook. The annoying refrain to 'Battle Of My Own', keeps beating and repeating those four words 'til you barf. The rather dark and groovy acoustic met electric guitar piece with a nod to 70's sideburns of yesterdays. It's a grower though as it gets better with each spin (up to a certain point of course). 'Broke 'N' Brokenhearted', 'All Time High', and 'Forever Young,' are three fine guitar rockers. 'Last Dance', the wicked gather-around the bonfire acoustic guitar song. They recorded similar ones in the early/mid nineties. Closing track 'Blind Faith', the flower-power ballad with a special nod to Sgt.Pepper only not half as great. Final verdict: No need for hysteria. It's the darn-good rather than superb album. It's however their best effort in a very long time and Elliott sound great (in the studio). Perhaps just a tad too diverse for its own best? Then again. You always expect better from one of your all-time best melodic hardrock acts.